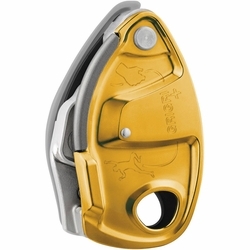 Petzl GriGri + Belay/Rappel Device. GRIGRI + is an assisted braking device designed for all climbers and for intensive use. It can be used with all single ropes (optimized for 8.9 to 10.5 mm diameter ropes). The reduction handle offers exceptional descent control. Particularly suitable for learning, the GRIGRI + has an anti-panic handle and a special mode for comfortable top-rope belay. Diagrams for rope installation engraved on belay device (interior and exterior). Extremely durable, for intensive use, thanks to the stainless steel wear plate. Anti-panic handle: if the user pulls too hard on the handle, the anti-panic function brakes and stops the descent automatically.